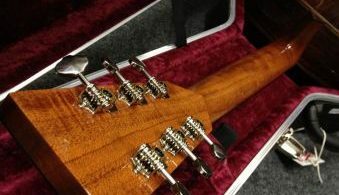 TJC Guitars repairs, modifies, setsup and re-finishes all types of guitar eg. electric, acoustic, bass, and any other variation of guitar out there. Just as importantly, he caters for the customer personally. Terry can carry out basic and full set ups to make your guitar plays how you want it to and has repaired, set up and modified guitars for hundreds of artists and bedroom guitarists, as well as building a lot from scratch on the way! Terry’s had articles in newspapers and magazines praising his work. Guitarist Magazine recently printed a small feature on a Gibson Les Paul Deluxe that had been destroyed by Hurricane Katrina and restored by Terry. Whatever sort of guitar you have, from cheap through to vintage, you can be sure of the same professional attention.